Your first time wearing contact lenses can be little scary, especially if you’re not sure what to expect and what to do if things go wrong. In this guide, you will learn everything that a first-time contact lens wearer needs to knows to be successful. The first step to finding success with contact lenses is making sure you use the brand that is right for you. There are many things to consider when searching for the brand that suits you best. Luckily, you won’t be alone in completing this step. Usually, your eye doctor or prescribing optician will be able to suggest brands for you based on your individual needs. Your eye care professional will use information such as your prescription for eyeglasses, the health of your eyes, and the reason you’ve given him/her for wanting contact lenses to narrow your choices down a few brands. Contact lenses are often discussed very broadly, but when it comes down to it, there is a multitude of different types of contact lenses. For somebody who doesn’t know a thing about contact lenses, it would be practically impossible to make the right selection out of all the different types. Poorly fitting contact lenses can cause bothersome eye irritation. Just imagine trying to make sense of all of the following jargon on your own; hard, soft, RGP, hydrogel, silicone hydrogel, hypergel, water gradient, water content, spherical, toric, astigmatism, presbyopia, multifocal, daily wear, extended wear, continuous wear, base curve, diameter, visibility tint, coated, etc. Once you’ve narrowed down the right type of lens is for you, your doctor will have to assess the fit of the contact lenses on your eyes. This is a very important step that should never be skipped. 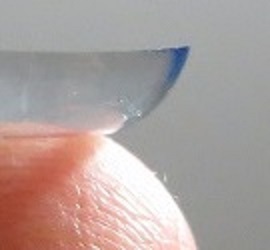 Every contact lens brand has its own unique shape, water content, curvature, etc. A good fit is established when the shape and curvature of the contact lenses compliment the shape and curvature of the cornea in a healthy way. This is not always the case and it can only be determined by using equipment such as bio-microscopes and slit lamps. If the fit of your contact lenses is not proper, your lenses will be prone to excessive movement on your eyes, creating discomfort and visual inconsistencies which can be harmful to the health of your eyes in the long run (and in the short run may cause your contacts to fall right out of your eyes!). Before you start wearing contact lenses, you have to decide on whether you’ll be replacing them every month, every 2 weeks, or every day. Depending on your preference you will either choose monthly, bi-weekly, or daily disposable contact lenses. Technically, there are more than those 3 options. If you search long enough you may come across contact lens brands that are designed to be replaced every 3 months, or ever once a year. However, these are generally not recommended. If you’re not sure how often you would like to replace your contact lenses, consider these pros and cons and consult with your eye care professional. There are two popular techniques for getting your contact lens out of the little plastic bubble it comes packaged in. Step 1: Peel back the removable seal. You can remove it completely or stop just before it’s about to come off. Step 2: Slowly pour out the liquid into the sink. Pouring slowly will cause the liquid to pour out while the contact lens stays behind. 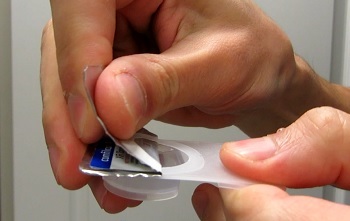 Step 3: Pinch the edge of the contact lens, pull it out of the packaging and place on your finger. Step 2: Use your thumb and index finger to grab flat part of the blister pack. Very rapidly and forcefully turn the entire blister pack upside down over your other hand. This will dump all the contents of the blister pack including the contact lens into your open palm. 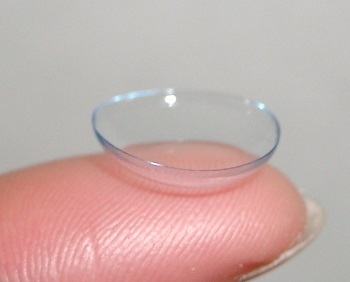 Step 3: Make a fist around the contact lens in your palm, and drain the liquid out over the sink. When you open your fist, all that will remain is your contact lens. Use your free hand to position the contact lens on your finger. For beginners, the best way to position the contact lens is on the tip of your index finger or middle finger. If you are more comfortable using your index finger to hold down your bottom eyelid, place the contact lens on the tip of your middle finger. If you are more comfortable using your middle finger to hold down your bottom eyelid, place the contact lens on the tip of your index finger. You may also find that using the index finger works better for one eye, and the middle finger works better for the other. That is perfectly fine. The key is to put the contact lens on the tip of your finger, and not on the pad of the finger. The contact lens should be close to where the fingernail ends. Of course, if you have very long fingernails, this will force you to have to move the contact lens down towards the pad of your finger. Not the best way to place a contact lens on your finger during insertion. 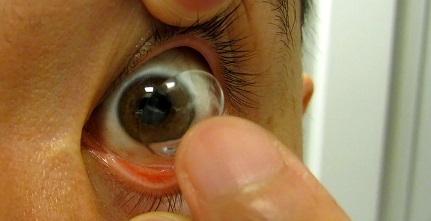 A better way to place a contact lens on your finger during insertion. The biggest challenge for a new contact lens wearer is controlling the eyelids during insertion. Naturally, as an object comes into very close proximity to your eyes, your eyelids will react by forcefully closing shut. This reflex can be overcome given enough time, practice and concentration. To give the contact lens sufficient space to go onto your eye, you have to keep your eyes open at least as big as the diameter of the contact lens. 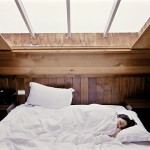 To do this, you will use fingers from both of your hands to hold the eyelids open. 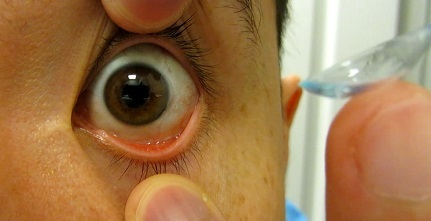 For insertion into the right eye, you will place the contact lens on the tip of your right index finger. The middle finger of your right hand will pull the bottom eyelid down and hold it there. To lift the upper eyelid out of the way, you will use your free left hand. Position your left hand on the top of your head with your fingers pointing down towards the ground. This will require you to lift your elbow up to about the level of your eyes. A Note About Controlling Eyelids: The closer your finger is to the edge of your eyelids, the better control you will have over them. 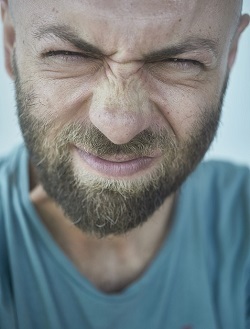 Use your left index or middle to grab the upper eyelid and pull it up towards your forehead. From here, approach your eye with the contact lens. 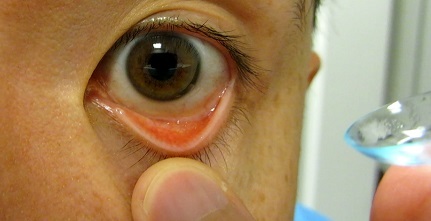 You should not be pushing the contact lens onto the eye. If you’ve created enough space for the contact lens and you bring it in at the right angle, it will transfer onto your eye on its own. Many first-time contact lens wearers will have a tendency to look away when the contact lens comes too close. This is okay. You can still get the contact lens in even if you’re not looking directly into the contact lens. If it isn’t working, do not try to force it in. Instead, go over your technique and try again. For insertion into the left eye, use the exact same procedure as above, but switch hands. Your left hand will hold the contact lens and pull the bottom eyelid down, and your right hand will go over your head and control the upper eyelid. Obviously, there are more than just 1 correct way of inserting contact lenses. For a different perspective, click here or on the image below watch a video tutorial on how to insert contact lenses. Something that may plague first-time contact lens wearers for a while is determining whether or not the contact lens is inside out. With experience, you will know almost instinctively, but at first, it helps to have a few tricks up your sleeve. I’ve written an article where I share my top 5 tricks on how to tell if a contact lens is inside out. Instead of writing them all out again I will simply direct you to that article. The edge of an inside-out contact lens flares out like a saucer. 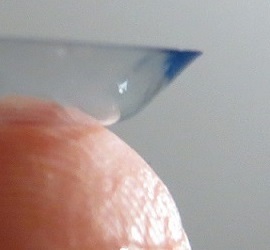 The edge of a contact lens in the correct position rounds out like a bowl. Hands down, proper hygiene is the most important responsibility of a contact lens wearer. 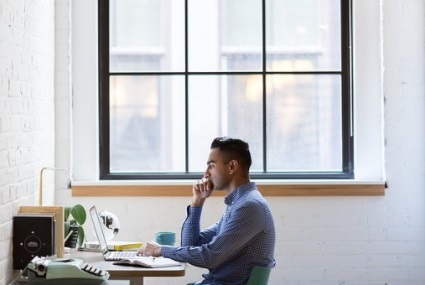 Failure to comply with proper procedures can lead to eye infections, which if you’re lucky will only cost you a trip to the eye doctors and some antibiotic eye drops. But if luck is not on your side, an eye infection can lead to permanent loss of vision and even blindness. The first thing you must always do before touching your eyes is properly washing your hands. This applies to when you’re putting your contact lenses in as well as when you’re taking them out. Throughout the day, we are constantly putting our fingers on things that hundreds of other people have touched before us. That means you’re picking up all sorts of germs on your fingers. If you stick your fingers in your eyes before washing those germs off, you’re not going to like what happens next. Some contact lens wearers develop a terrible habit of using their fingers to move or rotate their contact lenses when they feel that the contact lenses are out of place. If you feel your contact lenses moving in your eyes, that is a sign that you need to see your eye doctor to get better fitting lenses. But if you are going to touch your contact lenses for whatever reason, never do so on the fly. Always wash your hands first! Tip: Never assume that your hands are clean because you haven’t touched anything ‘dirty’ since you last washed them. If you’re going to touch your eyes, your eyes should be the very first thing your hands touch after being washed. 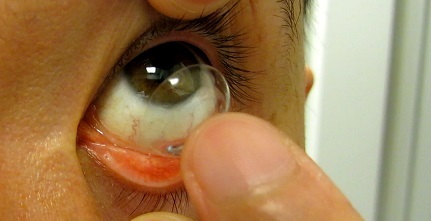 If you are using daily disposable contact lenses, this section does not apply to you. That’s one less thing you have to worry about! If you use contact lenses that aren’t thrown away every day, you are going to have to spend time cleaning your contact lenses every time you remove them from your eyes. Improper cleaning procedures can lead to contact lens deposit build-up and contact lens contamination, so pay attention! Contact lens cleaning procedures fall into 2 main categories. You will either be using a multi-purpose contact lens cleaning solution, or a hydrogen peroxide-based contact lens cleaning solution. 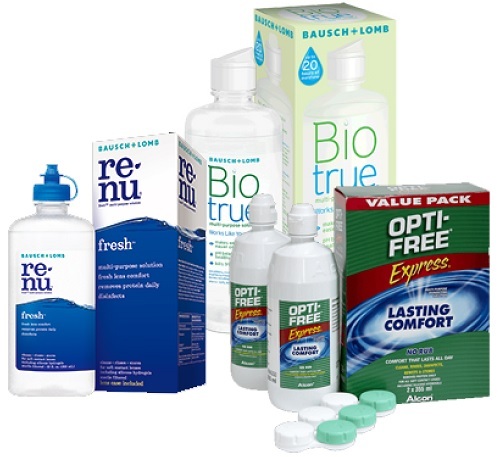 Different brands of multi-purpose contact lens cleaning solutions. An MPS is a cleaning solution that you will rinse, rub and store your contact lenses in. They are made of cleaning agents, anti-bacterial agents, buffers, and preservatives. Rinse both sides of the contact lens with your MPS. Place your contact lens in your cupped palm and submerge your contact lens with solution. 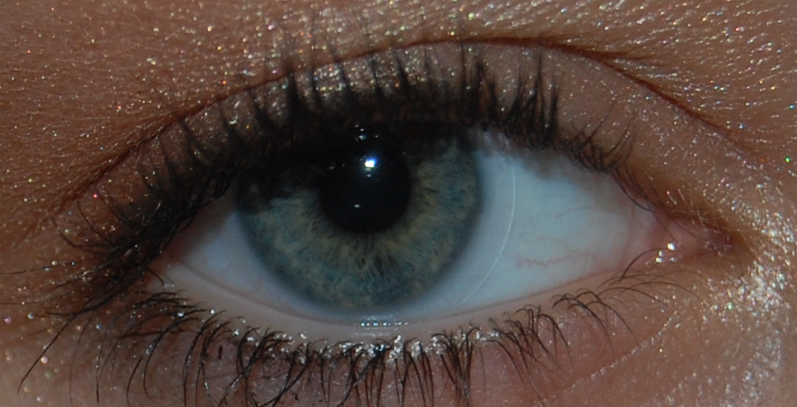 Rub the contact lens in a circular motion for 20 seconds. Turn it over and repeat step 4. Don’t forget to flip your contact lens back to the proper orientation. Rinse both sides of your contact lens again. Fill your contact lens case with solution and completely submerge your contact lens into it. Make sure your contact lens case is capped and secured. 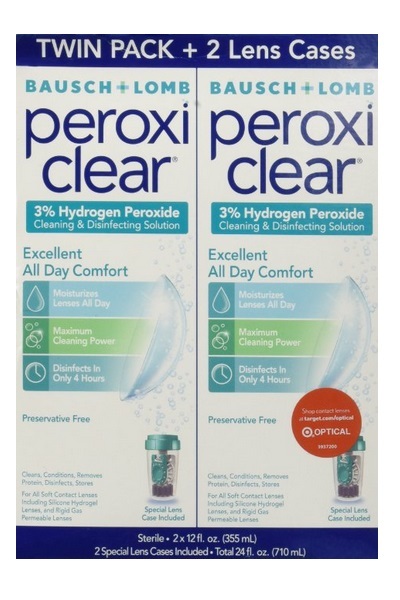 A hydrogen peroxide contact lens cleaning solution. Never make the mistake of thinking you can use a peroxide-based solution like an MPS. Trust me, you don’t want to be able to tell that story from experience. Please take some time to read it. Hydrogen Peroxide Contact Lens Solution – Are They For You? Cleaning your contact lens case is something that is often neglected in old and new contact lens wearers alike. Even though the only thing your contact lens case holds is the very solution that cleans your contact lenses, it still gets dirty! Clean your contact lens case out with soap regularly, making sure to rinse it thoroughly and allow it to dry (upside down) with the cap off in a clean place while you’re wearing your contact lenses. Contact lens cases are dirt cheap. If you start to see brown or green stuff (or stuff of any color for that matter) growing on your contact lens case, throw it out and start using a new one, please! 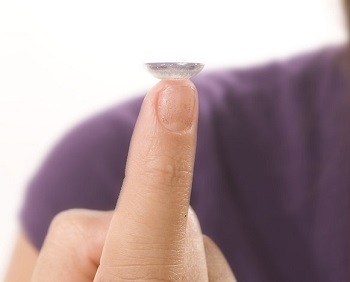 Your contact lens wearing schedule is important, especially for your first time wearing contact lenses. If you were professionally fitted with contact lenses, your optometrist or prescribing optician most likely gave you a wearing schedule for the first few days. Typically, these schedules will instruct you to start with only a few hours a day, and gradually build up to a full day of wear. The purpose of going easy at first to allow your eyes to get used to the feeling of the contact lenses. It’s normal for your eyes to be more sensitive to contact lenses during the first few days. So don’t torture yourself and take them out after a few hours. If you take away anything from this section, it should be this: contact lenses are not meant to completely replace glasses. It is wrong to think that once you start wearing contact lenses, you’ll never need to wear glasses again. Those who think that way are usually the ones who end up back in glasses from complications of contact lens overwear. Consult with your eye doctor to determine what the best contacts-glasses mix is. As a general rule of thumb, it is prudent not to exceed 70:30 contacts: glasses ratio. i.e., if you’re awake for 16 hours, don’t wear your contact lenses for more than 12 of those hours. As a first-time contact lens wearer, you might find that you are quite aware of the contact lenses in your eyes. This feeling usually goes away as we start getting used to them, similar to how we aren’t constantly aware of the feeling of our socks on our feet, even though they’re there. Having a fan or heater pointed at your eyes. Showering with your contact lenses. Sleeping with your contact lenses. Starring at things without blinking. Wearing your contacts when you’re really tired. 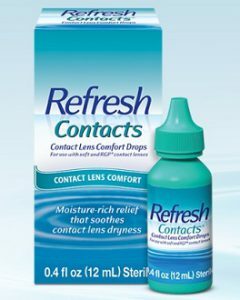 It’s not at all unusual to have to use eye drops throughout the day to maintain good comfort with contact lenses. This is especially true of people who spend long hours working at computer screens. I have an article that is all about the best eye drops for contact lens wearers. You can read it by clicking the link below. If it’s your first time wearing contact lenses and the answer to your question wasn’t found in this article, go ahead and leave your question down in the comments and I’ll be sure to help you out in any way I can. I hope this guide for your first time wearing contact lenses was helpful! Are Ortho K Contacts For You? 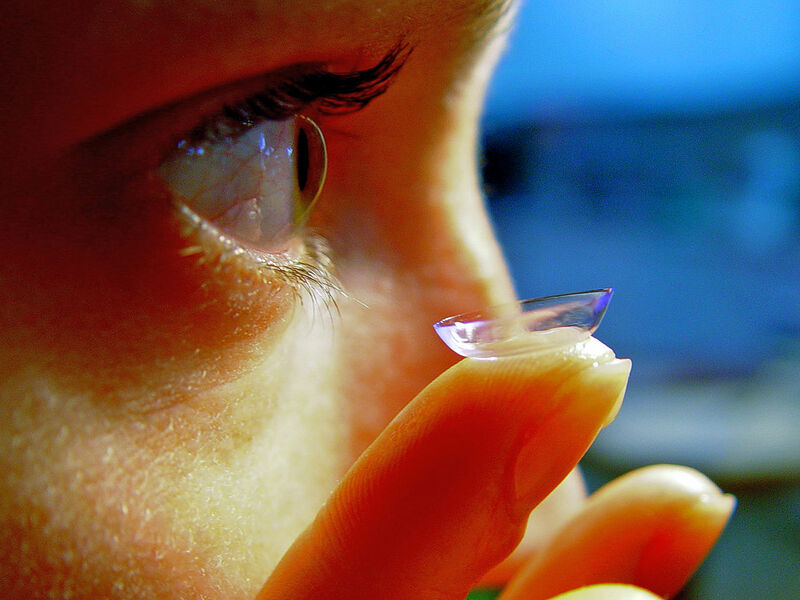 Are Permanent Contact Lenses Better Than Temporary Ones? How Long Can You Wear Your Contact Lenses For?